John and I had been talking about a case about a year and a half ago now, I think. While I love the fact that he offers so many options, it also can make it difficult to choose when it comes time to order...LoL! I told him all the little details about his cases that I just loved, and would love to see in a case I owned...the result is this case. Where to begin? Let's start with that this case is in the 2x5/3x4 configuration...which I think is brilliant...so flexible in a space occupied typically by a 2x4 case. The leather used in this case is a rich dark brown oil-tanned leather....which I think is perfect for an every day carry case. 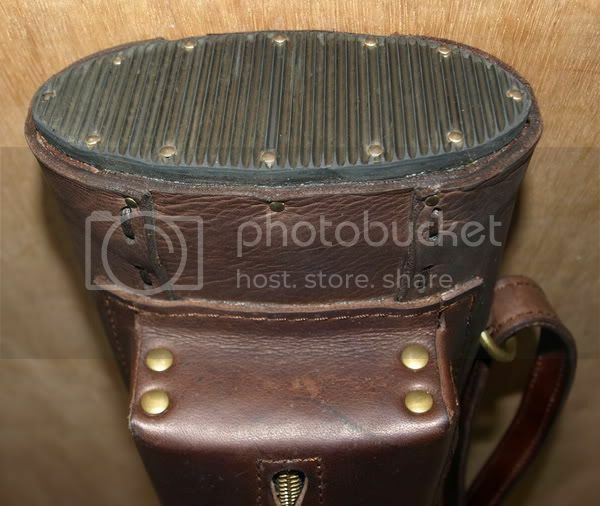 Oil-tanned leather just lends itself to the normal scuffing and such that would occur over time and use. Many can be simply rubbed away with the hand...or left alone, to add character. Smells really good too! 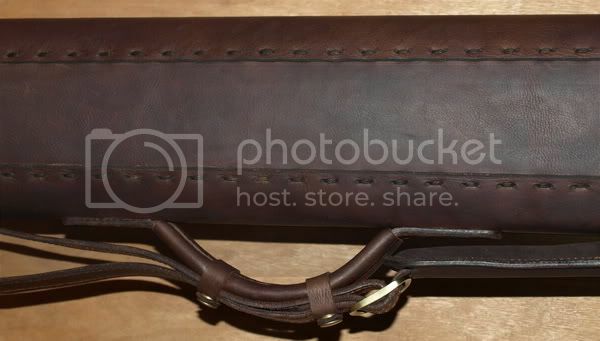 The case lid is a side opening, and secured with antiqued brass hardware, and is sturdy. The top handle is nice and comfy to carry, and again, very sturdy. Another nice touch is, instead of scallops and studs...this case's styling is simpler straight lines and lacing, which I think gives the case a quiet elegance. 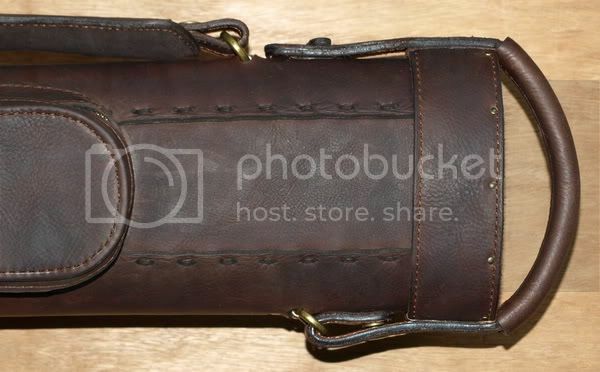 I also love that John went the extra mile and included keeper straps the bind the very well crafted and sturdy luggage handle and the shoulder strap and padded pad together. Just another nice touch. The puzzle latch is simple and effective, although obviously labor intensive...there is absolutely no worries about failure, as you can feel that it is handling the weight load quite easily. Another feature of this case that I love, and again, is so simple but effective is the non-skid rubber bottom. No more feet to worry about snapping off, and the case stays put. No more worrying about the case sliding down the wall. So, everything that I have mentioned and featured above, is standard to John's Tough Love Series cases. I don't think he could have more appropriately named this series of cases. They are tough. As I have previously stated, all the hardware is an antiqued brass. 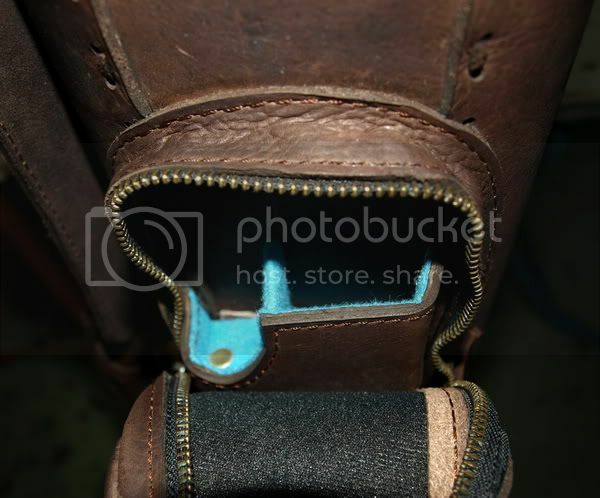 Stitching is top-notch throughout...I mean really, especially when the thickness of the leather is taken into consideration. The UltraPad Interior is everything John and others have said it is...almost makes you wish you were a cue...LoL! There is no where that I have found on this case where a corner was cut to save a buck...no where. From the minute you pull the case out of it's included protective Ultra-Suede bag, you know you have something very special in your hands. I would recommend one of John's cases, without a moment of hesitation, to anyone. Yes, the wait might be on par with that of some high end custom cue makers (kidding)...but John's cases are worth every minute of the time you wait to finally receive it. They're just that good. What's the point of havin' a rapier wit if I can't use it to stab people?